There is much talk, if not controversy, about how to split up the Big Island of Hawaii by region so that it can easily be described on a website such as this. Why the controversy you ask? 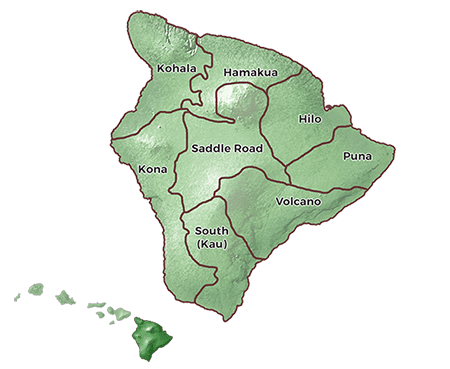 Well, Hawaii, like all the Hawaiian islands, is part of a county politically divided into several districts, clockwise: South Kohala, North Kohala, Hamakua, North Hilo, South Hilo, Puna, Kau, South Kona, and North Kona. Quite honestly, to the modern day traveler these districts serve no purpose. The remedy then is to find a way to divide the island into segments that are easy to recognize, describe, and access via the major roads of the island. This is where much of the debate comes from. Every "expert" has their own way of dissecting the island into pieces. Our way is pretty simple and it's a method we've followed in all of our physical guidebooks and eBooks. Ultimately we've divided the island in a manner that helps us group attractions together so that they are easily accessible along the major routes of the island. This allows us to use our mile by mile directions to easily and accurately describe each spot here on our website.